Number of Pockets: 5 plus "kitchen sink organizer"
Max. Load Carried: 71 lbs. I bought this pack in '93 for a Venture Scouting hike in Montana. I chose it based on the first impression in the store and my previous experience with a friend's Camp Trails pack. It was easy to fit to my torso and the straps are very comfortable. The "kitchen sink" organizer is great. Any small items are easily stowed and accessed using this feature. The position of the water bottle sleeve is also great just reach up and your bottle just falls into place. I hauled in excess of 70 lbs. on that hike. We had to haul our gear plus divided up the Troop gear. The day before the hike to camp on a lake in the Gallatin National Forest, two of our group had to leave due to a family emergency. The rest of us had to take on the gear they were to carry. It was almost too easy to add gear into and on this pack (that's why my load was so heavy, nobody else could stuff the additional gear as easily). For the money, it is as good as an external frame gets. I also have the internal frame version for winter hikes. Pack carries well. Carried up to 60 lbs. in the mountains. Pack carries well. Carried up to 60 lbs. in the mountains. No problems. I am 5' 7" tall; the pack has alot of adjustments so it would fit most anyone. Carries well with 60 lbs of supplies for week long trip. Lots of pockets to keep things organized. Had no problems on trail or off. Very stable. Bought about 15 years when my son started in Boy Scouts. Still carries well, no broken zippers or ties. We will be using this pack for the first time this weekend. My son is 15 y.o. and we found this pack at our local thrift store in excellent condition. Thanks for all the great reviews. It helps to see from others what we have. 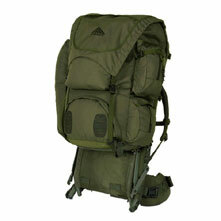 This pack has been outstanding, the space, organization, ease of adjustment, and comfort during use. I looked for approx. 1 1/2 years to find the pack that would fit me correctly, and live up to my standards of performance and durability, this pack has done just that for the past twelve years and still is going strong. On a recent trip out west for a backpacking, some others in the party did not understand why I went with this pack until I allowed the one adult who had to be high tech try carrying it for a short time, he too loves this pack too now. I wish that more packs had the thought to the ease of the water bottle placement, and the comfort of the suspension system. This is a reallly nice pack for the compulsive organizer. Max. Load Carried: abouit 40 lbs. This is a reallly nice pack for the compulsive organizer. There's a place for just about everything. I also have a Dana Design internal frame pack and can't say that I feel any less agile with the external frame pack. It seems to be reasonably well made. I've had no problems with it. Camp Trails Wilderness is a very well designed pack. Camp Trails Wilderness is a very well designed pack. It is very comfortable, the pockets are large to hold a lot of necessary gear. The "kitchen" is a part of it and really helps in organizing and getting to itmes. The "kitchen" opens up to a large storage area behind it. I highly recommend it. I have a 10 year old Camptrails Wilderness External and love it. Just recently noticed some fraying on the waist band and after my latest trek (32 miles) across the Smokies the damage is significant and it's time to replace or repair. 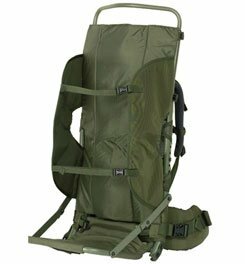 Anyone know where I could purchase a replacement hip belt for a Camptrails Wilderness External pack? The Camp Trails Wilderness (External) is not available from the stores we monitor.